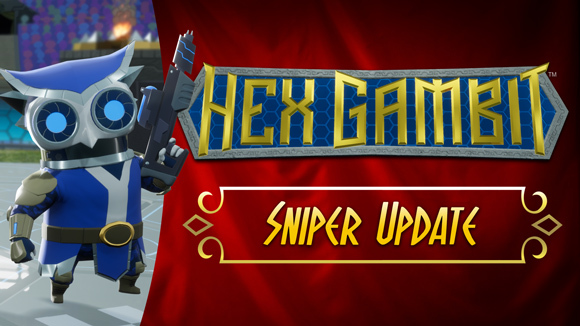 Hex Gambit Early Access gets a new minion today, so let the team customization begin! There are now six different combinations to choose from, or you can let yourself be surprised by setting as many minion slots to Random as you like. Longshot: Deals the usual 2 damage at ANY distance along a straight path. This will fire through your teammates, but the bullet is stopped by enemies and barriers. Airstrike (Need 3VP): A mortar-like move that only hits at a distance of exactly 3 spaces. It deals an impressive 4 damage, but you’ll need a turn to recharge it. Tapping Round (Need 5 VP): If you have a straight shot at the enemy pillar, this move lets you tap for 1VP from across the map. Another modest gameplay tweak was included in today’s update: we’ve standardized the special move unlocks into 3 easy-to-remember thresholds: Early Game unlocks all happen at 3VP now, Mid-Game unlocks are at 5VP, and a few rare Late Game unlocks will happen at 7VP. Next on our agenda is the last minion class for Hex Gambit’s launch: the Pacifist. We’ll also be trying to squeeze in a few long-talked about character buffs before we shift our focus from minions to other features.